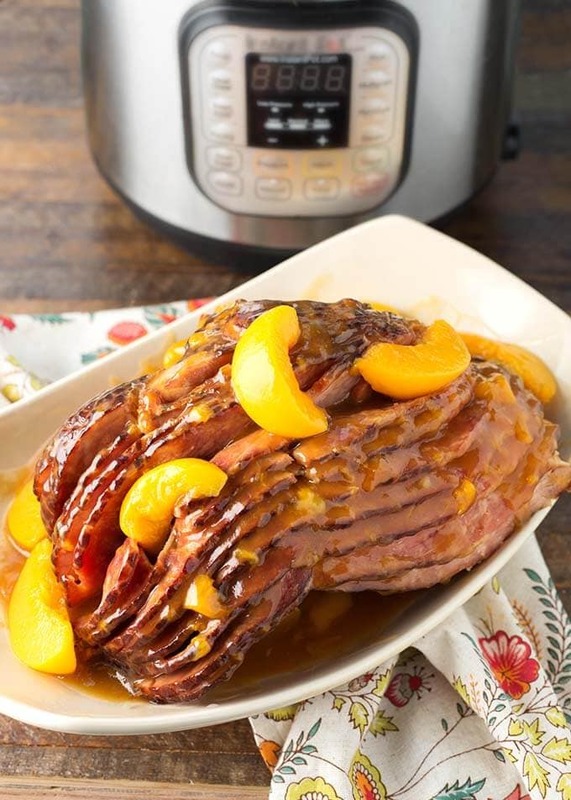 Instant Pot Peach Glazed Ham is a delicious spiral cut ham that you can make in about an hour! 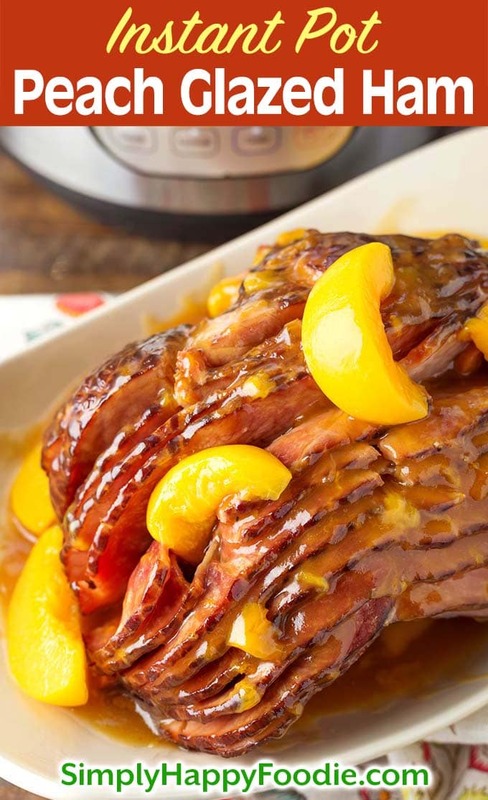 Juicy peaches, brown sugar and spices make this pressure cooker peach glazed ham something special. Serve for Easter, Christmas, or any Holiday! I love peaches! 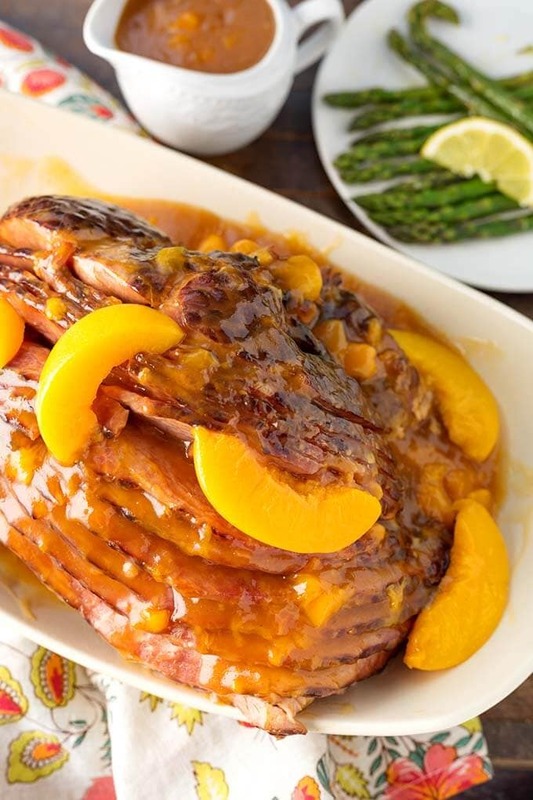 This ham with a delicious peach glaze reminds me of a peach pie, but with that savory flavor added! With just the right amount of salty and sweet, this might possibly replace your pineapple glazed ham. Fruit and pork always go so well together that this recipe HAD to happen! It is so simple, and you can personalize it to your liking. Adjust the spices, or even add some peach flavored booze (brandy, whiskey, or liqueur). Not too much, lol! 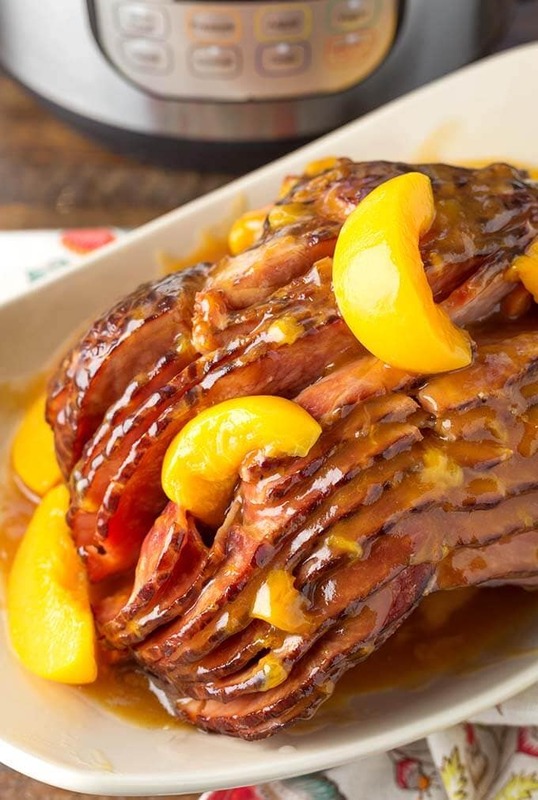 Which Peaches are Best for This Ham Recipe? I wrote the recipe for canned peaches, but you can use frozen or fresh if you want. If you do, use a cup of peach nectar or water in place of the juice from the cans of peaches. Why is the Cook Time So Short? Because not only is this a precooked ham, it is thinly sliced, which means that the ham could easily dry out. It needs a quick cook time in the pressure cooker. If your ham is uncut, increase the cook time. I belong to a group on Facebook called Instant Pot 101 for Beginners. This group is awesome for not only beginners, but for all levels of IP users. There are recipes being shared, questions being answered, and many of the top Instant Pot bloggers, including little old me, give live demonstrations on Saturday afternoons. The videos are saved and you can watch them any time! Join us! 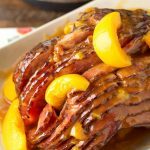 Instant Pot Peach Glazed Ham is a delicious spiral cut ham that you can make in about an hour! Juicy peaches, brown sugar and spices make this pressure cooker peach glazed ham something special. Serve for Easter, Christmas, or any time! Soak your ham in cold water for an hour if you can, then drain and rinse it well. If you can't soak it, just rinse it very well. This reduces the saltiness of the ham. Add ham to the pot, cut side down, if possible. I can fit a 9 lb spiral ham in an 8 qt pot, depending on the shape. I can fit up to a 7 lb ham in my 6 qt, depending on the shape. Add one can of the peaches to the pot, and add the juice of the second can to the pot, reserving the peaches from that can (If using an 8 qt pot, add 1/4 cup of water just to be sure there is enough, but not too much, liquid to get the pot to pressure). Put the lid on the pot and set the steam release knob to the Sealing position. Then press the Pressure Cook/Manual button or dial, then the +/- button or dial to select 3 minutes (If your ham is 8 to 9 lbs. If cooking a 4 to 7 lb ham, do 2 minutes). High pressure. The pot will take several minutes to come to pressure. When the cook time is finished let the pot sit for 5 minutes, then turn the steam release knob to the Venting position to release the remaining steam/pressure. Turn off the pot. Remove the ham to a platter or pan and wrap in foil, or cover with something to keep it moist. Turn on the Sauté setting. Add the peach preserves, ginger, cinnamon, cloves, red pepper flakes, and brown sugar. Stir well. When the contents of the pot start to simmer, add the corn starch slurry. Stir until thickened. Turn off the pot. Slather the glaze all over the ham, reserving some for serving at the table. At this point you can broil in the oven to caramelize the outside, or serve as is. Garnish with the reserved peaches. *If your ham is uncut, increase the cook time to about 30 minutes. This is the best ham I ever made! I used a half ham that wasn’t sliced. Thanks for the awesome recipe! That’s great, Kelly! Did you by chance watch the video in the Facebook group? It looks delicious, pretty and easy. Definitely going to try! I think, my family would love it:) But What happens if I leave out the Cinnamon? It will still be delicious! Will it really be too salty if I don’t rinse it? For the last several years we’ve made our ham in a crockpot. This year I want to try the pressure cooker. I’ve never rinsed a ham before. It’s up to you, but I find that soaking and rinsing the ham improves the flavor as it takes out some of the saltiness. Looking forward to trying this. When you place the ham in the pot, do you use a steamer like you mention in your bone-in recipe? I do only if it fits. If you do use a rack, make sure to add the first can of peaches and juice to the pot first, so they are down in the liquid. Thank you so much for this recipe and this site. You’re welcome, Kathleen! Thanks for being here! Should you keep the foil on when broiling the ham? No, just add the glaze and broil it, watching so it doesn’t burn! Made this tonight for Easter dinner, it was amazing! Thanks for the recipe.